Design Dance Studio is excited to present Bloom, a spring showcase of dance. May 11th, 2:00pm and 7:00pm, at Central High School Auditorium. * *This is not a TCAPS affiliated event. 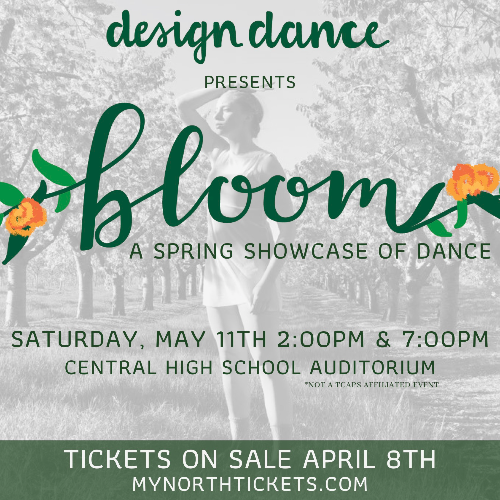 Design Dance Studio is thrilled to present their first spring performance of Bloom, a spring showcase of dance, on May 11th at 2:00 and 7:00 pm at Traverse City Central High School Auditorium*. Founded in 2018, Design Dance Company aims to empower young artists through extensive art and performance education by creating opportunities to share their passion with the community and providing them with lifelong skills to enrich their lives and the lives around them through movement. Bloom offers a full show of choreography by Veronica Woods, Madelaine Mitchell-Ward, Melissa Ray, Melinda Baker Abby Niessink, and Lisa Reehorst, in the genres of contemporary, ballet, jazz, and lyrical dance. Design Dance Company dancers, ages 8-15, are excited to share their hard work and commitment with an audience. The show also includes a performance of Design Dance Studio's Baby Bees, ages 3-5. Design Dance Company is thrilled to present their brand new works, and introduce themselves as a new opportunity for dance in Traverse City.